How to merge two or more AVI video files into one? I am a amateur photographer, and i shoot many beautiful videos when travel in holiday. I want to combine several video files into one,but I don't know how to do it, or is there any software can do it. Thank you in advance. For video recording lovers, do you find that when you record a longer video, your video camera seems to split the video files? Assuming you don't wanna your video being split into seperate parts, you need a video merging software to combile two or more video clips inton one. This article will share with you the ultimate tool to combine files into one; merge subtitles with videos and merge videos on iPhone. Pick the part you need to read. Wanna a Hassle-Free Way to Merge/join/combine video clips on Your Mac? 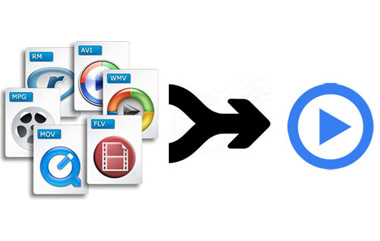 ▶ Merge/join/combine multiple video files into one, just a click away. ▶ Merge videos of any format, incl. MP4, HEVC, H.264, AVI, WMV, MOV, MKV, AVCHD, FLV, etc. ▶ Also crop/trim/split/rotate videos, add subtitles and effects to videos, adjust brightness, slow down/speed up video, etc. Plus, equipped with hyper-threading technology and unique Hardware acceleration, this all-conquering video merger software can ensure you to get the video files with 1:1 lossless quality in seconds without using up your CPU. And after the video merging task successfully achieved, it can even allow you to transfer the video files to iPhone iPad Android and convert them to MP4, etc that is perfect for uploading to YouTube, Facebook and more. This tool not only works with joining, cutting, rotating, etc. editing features, but also works as a video converter that supports to convert iMovie friendly videos MP4, MOV, M4V to any video format you want so that you can also cut or merge iMovie videos as you desire. Before you combine videos together, please free download video joiner on Mac. Step 1: Load the video files you want to merge. Step 2: Select the videos you are going to merge. And check whether the default destination folder is what you want, if not, click "Browse" button to choose the destination folder. Step 3: Choose the status Merge All "On" and click "RUN" button in the main interface to begin to join video MP4 MOV AVI and more. On top of just joining video files together, some guys perhaps also have the need to merge subtitles with videos. How to make this happen in the easiest way? Calm down! Needless to look around, still the free video editor for Mac can handle this for you seamlessly. See, after you download movie subtitles or English subtitles, you can import the subtitles into the video to merge subtitles with videos under the help of this video subtitle merge. How to add subtitles to videos? The picture shown on the right side can give your direction. Step 1: Tap the Subtitle button. Step 2: Click Add SRT File... to load it or you can search the subtitles from the local hard drive. Step 3: Click Done to enable to add srt file to your video and merge it. Well, last but no least, the 3rd part will focus on how to join videos with video combiner for iPhone. Here selects out top three apps for iPhone to merge videos. 1. Video Merger FREE – Only six steps to complete the whole video merge process on iPhone. This free video merge app is designed for iOS 8 or later iPhone iPad iPod. After video merge, you can also choose "Effect" on edit video, add overlay to video, change video background color, etc. 2. Video Mixer – It's regarded as the most simple and easy to use app for merging videos and audio on iOS iPhone. When you merge videos on iPhone iPad, you can also select a music as you like. Compatible for iOS 7 or later and charge you at $0.99. 3. 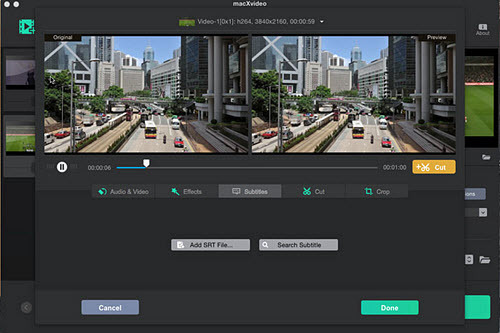 Video Editor Free – It supports combining various video formats into one and has notable other features like sharing and trimming. But it's other video editing features needed to be improved. All in all, it's a great choice for video combination. Follow the guide to edit whatever videos at any resolution of up to 4K and produce stunning videos for uploading to YouTube effortlessly. Video cutting solutions of MP4 cutters, introducing you two kinds of MP4 cutters, MP4 cutter software and MP4 cutter online, to split trim and cut MP4 video files without re-encoding. Editing videos recorded with GoPro won't go any hassle if with the right GoPro video editor. Process your GoPro video at the fastest speed and highest possible quality, in the easinest way. Feature-rich MacX video joiner can easily merge two or several video clips into one instantly just a click away. 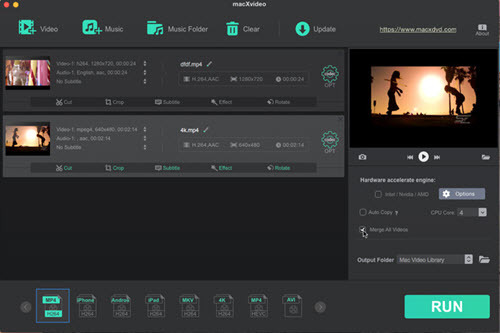 It also lets users to convert videos to MP4, MKV, AVI, MOV, etc. 180+ video & 14+ audio formats. Joining videos to mobile device is available, as well. The easiest way to crop/merge/trim videos, apply effect and more. To upload videos, reduce file size, capture the essence or send over email, plz follow the guide. If you have a lot of MP4 videos to be edited, follow the software to turn your MP4 into stunning creation.